What comes to your mind when you see hockey in any of the books or online article? He is none other than Major Dhyan Chand. Major Dhyan Chand is also renowned as the Magician of Hockey. His unbelievable skills was always a surprise and mystery for every viewer. During the match, most of the time, the opponents used to sit like silent ducks and watching him as the only person playing on the ground and scoring continuous goals for his team. He played an important role in winning three consecutive Olympics gold medals in 1928, 1932 and 1936. Because of his God gifted skills and die-hard dedication towards hockey, his birth date i.e. 29th August is celebrated as the National Sports Day all over the country. Below are some of the interesting facts that you all must know about Major Dhyan Chand and take him as your idol. Major Dhyan Chand joined Indian army when he was just 16. He used to practice at night, under the moon light. This made his fellow friends to give him the name “Chand” which means the moon in Hindi. During the 1928 Amsterdam Olympics, he scored 14 goals and become the top goal scorer in the Olympics. Few of the media reports quoted him as “it was not a game, instead was a magic”. They gave him the name “Magician of Hockey”. In 1932 Summer Olympics, the Indian hockey team defeated the USA by 24-1 score and Japan by 11-1 score. Out of the 35 goals, Dhyan Chand scored 12 goals while 13 goals were scored by his brother, Roop Singh. This gives them a name of “Hockey Twins”. Once during the match, Major was unable to score a single goal. He argued with the referee regarding the measurement of the goal post. Everybody was amused to see this. However, this amazed everyone when the measurement was found to be wrong according to the international rules. During one of the match, Adolf Hitler was highly impressed by the skills of Major Dhyan Chand and hence he offered him the German citizenship. He also offered him a higher position in German Military. However, Dhyan Chand denied to his offer. Once Netherlands hockey authority broke his hockey stick to check whether there is any magnet in his hockey. On his birth date, President of India honors Rajiv Gandhi Khel Ratna Award, Dronacharya Award and Arjuna Award to the deserving candidates, who devoted their life for sports. 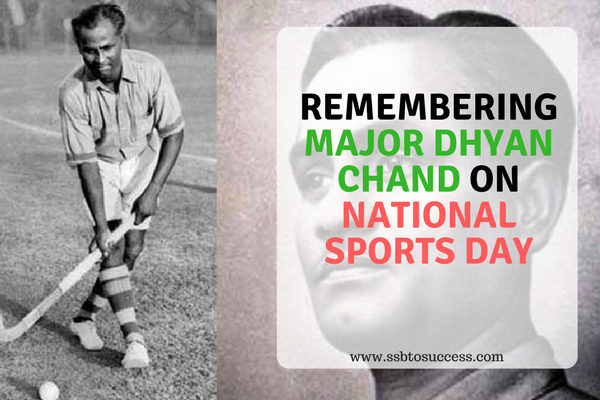 There are many more interesting facts that will make you feel proud about Major Dhyan Chand. What are the other facts that you would like to add about this Magician?